To continue on the vegan Thanksgiving theme I thought you might be looking for dessert. Now anyone can make a vegan apple pie, maybe not as good at my mom’s, but anyone can do it. I’m not going to go there, no pie today. 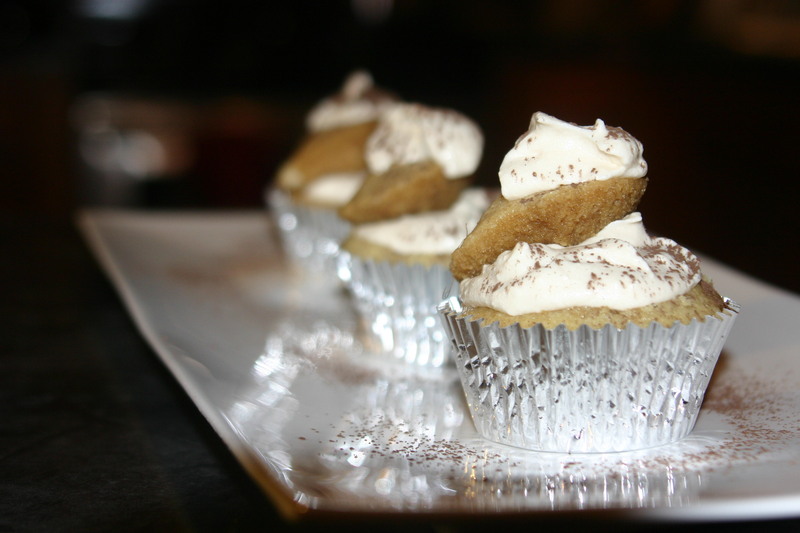 Today we go for luxurious, sinful, and beautiful vegan tiramisu cupcakes. So yummy! I have always been into food, reading cookbooks, magazines and the like. I had heard about tiramisu, but never tasted it until my mom and her best friend took me and my best friend (also my mom’s best friend’s daughter) to New York City for our high school graduation present. There I went into an Italian bakery and had my first taste of heaven. I later went to Italy to study abroad and made it my mission while I was there to taste as many different versions of Tiramisu as I could. Over the years I have put all my tasting of the dessert to good use and have now created my own vegan version of the classic Tiramisu. This cupcake version is sweeter than the classic, but I think pretty darn good. These cupcakes can easily be made a day or two ahead of time. I actually like them better the day after I make them; I think it gives the coffee time to settle into the cupcake and the tiramisu filling to settle into perfection. I know these seem a little time consuming, but they are actually pretty fast. Just make the cupcakes, while they are in the oven make the filling. Put the filling in the refrigerator until the cupcakes are totally cool, then assemble according to the directions. No problem. Final note: I use Vegan Cupcakes Take Over the World vanilla cupcake recipe because it is the best. No reason to try to make up something that will pale in comparison. This link, Vegan Vanilla Cupcakes, is to an online version of the recipe, but you should really get the book and be on your want to happy vegan cupcake land. Heat 2 TBL of bourbon, 5 TBL of sugar and the splash of espresso over very low heat until the sugar melts. Stirring often. Once the sugar is melted remove from heat and cool to room temperature. Using a mixer cream together the cream cheese, butter, shortening, powdered sugar and vanilla. Add the brandy sugar mixture and cream together until smooth. In a small bowl mix the 1/2 cup espresso, 2 tsp of vanilla and 1/4 bourbon. When cupcakes are cool cut out a good chunk in the center of the cake. Spoon about a tablespoon of the espresso bourbon mixture into the cut out section of each cupcake and let it absorb into the cake. Once the liquid has absorbed spoon the cream cheese filling into the middle of each cupcake. Dip the cup out part into the espresso mixture and put it back on the cupcakes like a little hat. Top with more filling and sift cocoa powder over the top if desired.